LINES, VINES, AND JONAS TIMES: Jonas Brothers: soon over ?! 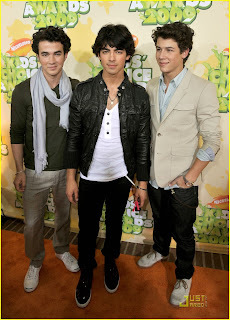 The world-conquering superpowers of teen-pop juggernaut the Jonas Brothers have once again been called into question — and this time not just by some know-nothing blogger! In yesterday’s New York Times, Brook Barnes adds up the twin disappointments of the trio’s low-grossing 3-D movie and low-rated TV show and asks, “Are the Jonas Brothers fizzling as a full-blown Walt Disney Company franchise?” Surprisingly, their manager and the president of their record label say no. But it’s plainly obvious that the Jonases haven’t become the money-printing, three-headed Zac Efron that we once had them pegged for. So, why not? So why haven’t today’s sensible teenagers fallen in line? We have no idea! We’re already on record as having enjoyed their last album, and find their recent failures as baffling as Miley Cyrus’s continued success, proving that we know nothing. By the way, have you heard their new single? We’ve embedded it below. We think it’s awesome, which makes us worried the Jonas Brothers might soon be over. With us OJD-ers ?! JONAS BROTHERS WILL LIVE ON FOREVER! I don't get why they're so low-rated, with all those "mrsjoejonas" 's on youtube. SUPPORT OUR BOYS, SHEESH !